So this name is kind of normal, maybe? Out of all my posts so far, this name might be the best so far. It’s dashing. It has alliteration and rolls right off the tongue. It’s cool without trying to be too cool! I don’t really know what quite inspired this character. I actually wanted a mediator in-between my villain and my heroes. He’s best friends with the villain and relies on him for a medicine he takes. But he’s also dating one of the heroes. I think Devlin could be an interesting character, but I created him with the wrong intentions. I needed him to be a “filler,” but I should have fleshed him out more. I should have cared for him more. Now he’s sitting at the bottom of the barrel with way too many unresolved potential plot-lines. ADDITIONAL FUN FACT: Devlin is part of a group of characters that were inspired by my small group of high school friends. The real Devlin was actually named Devon. He was a boy many of my friends had a crush on–the skinny jean wearing emo bad boy. Devlin is neither of those things. Darcy, huh? And Devlin is such a cool name! Thanks. I will admit…it’s a not so subtle homage to my second favorite Pride and Prejudice character. 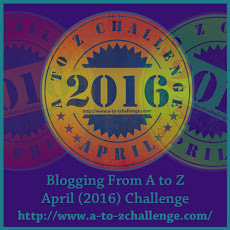 Oh my Gosh, I started reading your A-Z posts and next thing I knew, I was in mid 2015! You have a great style of writing that sucked me in! If these are the retired characters, I’d like to read about some new ones. I’M SO SORRY IT TOOK ME FIVE DAYS TO GET TO YOUR COMMENT. I was on a trip for an academic conference, and I just go back, so I’m playing catch up. Thank you so much for your wonderful comment. It means a lot. I absolutely love writing and growing, and I still have a long way to go, but this is very encouraging.